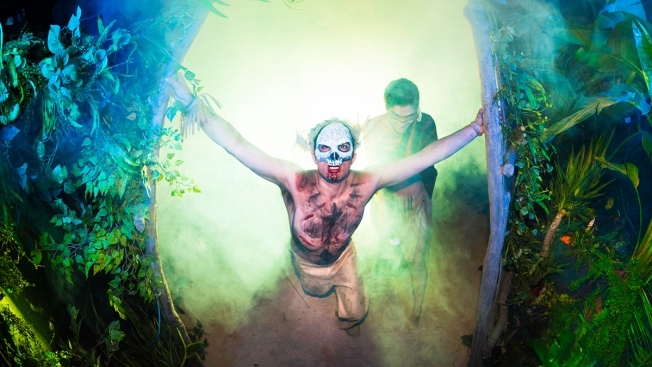 Lenape Indians, the original denizens of Manhattan, come to life in the Nightmare haunted house, which features myths and legends from New York City this year. Zombies just don't cut it anymore. Haunted house owners across the U.S. are pouncing on the latest trends in fear as they compete to stay atop an industry centered around a few weeks each year. Some of the country’s top fright sites are returning to classic scare tactics and revving up the shock factor as they compete for shrieks, thrills and a piece of the $1 billion in annual revenue the Haunted House Association says is generated by some 3,500 haunted houses, hayrides and mazes. ScareHouse in Pittsburgh, Pa. is located inside of a nearly 100-year-old historic building. This year’s popular motifs include classic horror with a tinge of the supernatural, a theme that’s echoed by the fall release of a freak show-themed season of the popular television series "American Horror Stories.” Dr. Margee Kerr, a sociologist who studies trends in fear, says people are sentimental these days and are into old-fashioned 1930s and ‘40s horror. Still, a throwback to fears of years past alone won’t always cut it. Some haunted house operators are trying everything from 4-D special effects to shocks tailored to each visitor’s fears to keep customers screaming and coming back. Some look to science for help divining the latest scary features. Kerr puts her sociology expertise to work for ScareHouse, a haunt in Pittsburgh. She pores over customer surveys from years past, looks over trends over time and even does her own physiological before-and-after studies, using EEG brain scans, in collaboration with the University of Pittsburgh. “I’m looking at what neuroscientists and psychologists know about fear and using that to create an enjoyable experience,” Kerr said. Photo credit: © Copyright 2014 Undead Productions. Photo by Rachellynn Schoen. All Rights Reserved. 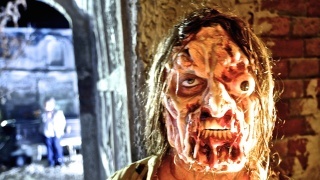 Zombies became big around 2009, a year before the wildly successful television show “The Walking Dead” premiered. They eventually peaked in 2011, and are now on the way out. Before that it was vampires. And now it’s that nostalgic look back at the old fashioned and legendary. “One of the biggest themes I’ve seen this year is this sort of hearkening back to old times,” said Rebekah McKendry, the director of marketing at Fangoria Entertainment. You can see the trend at Nightmare NYC, where this year’s theme is a look at the myths, legends and folklores of New York City. When you enter Nightmare you’re immediately transported back to a time when Manhattan was called Manhatta and inhabited by the Lenape Indians. The old inhabitants chant amid fog and twisting vines. According to Nightmare founder Tim Haskell's vision, the natives cursed the new inhabitants, thus unleashing all sorts of horrors on the city that are featured throughout the house: sewer alligators, subway dwellers, Typhoid Mary, the headless horseman, gargoyles, the rat king, Cropsey the child killer and the seedy criminal labyrinth of ‘70s New York City. Typhoid Mary at Nightmare NYC. Nightmare has changed its theme every year, and like ScareHouse, asks for its customers input. Haskell says they did a take on vampires around the time “The Vampire Chronicles” and “Twilight” came out in 2009. Of course, tuning into people’s fears and creating forms of entertainment that speak to those fears is not a new idea. Rob Zombie's Great American Nightmare in Scottsdale, Az. The art of the scare has ancient roots. From the beginning, Greeks, Romans and other ancient civilizations created Gods to speak to their fears of an unforgiving world, according to Kerr. To bring these fears to life, they put on plays, spawning theatrical techniques still used in today’s haunts, like fog, fake blood and trapdoors. As civilizations grew and people migrated, a fear of the elements transitioned into a fear of other people in the form of ghosts, demons and witches. Christians in the Middle Ages traveled from town to town, putting on plays and pageants to scare locals away from sin. 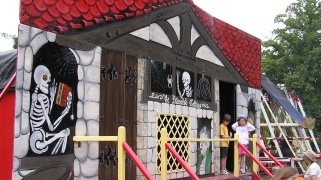 "The Haunted Castle" attraction at the Hoppings festival in Newcastle, England. By the 1800s, industry was booming, and with it the fear of a rapidly unrecognizable world, one fueled by electricity and other mystifying inventions. This sparked a renewed interest in ghosts, spirits and the supernatural. People paid to watch magic shows, get their fortunes told and enter houses supposedly haunted by spirits. The early 1900s saw the beginnings of the haunted attractions we know today, said McKendry, the Fangoria marketing director. At the notorious Theatre du Grand Guignol in Paris, audiences were shocked by gruesome plays. In 1915, Orton & Spooner concocted what may be the first, true haunt: a dimly lit funhouse, where floors shook and demonic screams roared from phonographs. An old Theatre du Grand Guignol poster from the 1920s. From there, the dark arts accelerated. All across the U.S., freak shows and carnivals drew crowds on autumn nights, capitalizing on the terrifying and bizarre. Dark rides carried passengers into a world inhabited by dangling bats and animatronic skeletons. Orton & Spooner Haunted House (1915) in Liphook, England. But it was Walt Disney’s Haunted Mansion in Los Angeles, which opened in 1969, that raised the bar, influencing haunted attractions for years to come, McKendry said. The house used special effects, old and new, to create rooms alive with moving skeletons, witches and ghosts. “The Haunted Mansion really did pave the way for the modern, linear haunted house that we know and love today,” Kerr said. The Haunted Mansion in Anaheim, Ca. In the 1970s, when haunts were usually at theme parks, a national charity organization based in St. Louis called the Jaycees began encouraging its younger members to raise money by turning vacant houses and lots into haunted attractions. Jim Carrey Celebrates Halloween on "SNL"
“Even today the owners of these huge haunted houses will tell you they first started in the ‘70s, creating ones for the Jaycees in their backyards,” McKendry said. This do-it-yourself approach was popular in the 1970s and ‘80s, before the bigger outfits came along and regulations took hold of the industry in the ‘90s. Field of Screams in Mountville, Pa.
Steve Kopelman, a haunted house expert and a pioneer in the industry for over 30 years, says fears over trick-or-treating in the '80s made haunted houses even more popular. Retailers helped fuel the haunted house craze too. “They were looking to bridge the gap from back-to-school to Christmas, and they latched onto Halloween,” Kopelman said. The increasing popularity of haunted houses made it possible for like-minded people to get together and put on a show. Ross Karpelman and his friends started the House of Shock in New Orleans in his backyard. In a city known for its celebrations, House of Shock was more of a giant party between friends than a business when it first kicked off back in 1993. House of Shock in New Orleans, La. From the beginning, the house embraced taboos -- devil worshipping, the occult and voodoo -- even as others in the industry warned that running such a controversial haunt wasn’t a viable business model. “When we first started, it was sort of a ‘the devil has moved into your neighborhood’ type of thing,” said Karpelman. The attraction still features satanic monsters, freak shows, live metal bands, an Ozzfest MC who lobs insults at the crowd, and people suspended from the ceiling by hooks pierced in their backs. But 21 years later Karpelman's brand of “in-your-face, intense occult horror” just doesn’t scare people anymore, he said. With sales down he and the other owners are deciding whether to revamp the house or shut it down all together. 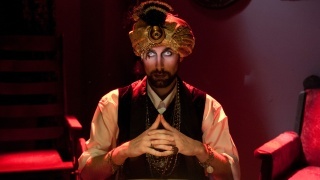 It’s a different story over in Las Vegas, where hauntrepreneur Jason Egan runs the eclectic haunt Fright Dome. Like House of Shock, Fright Dome had humble beginnings. Egan starting putting on haunted houses when he was a teenager and eventually moved to Vegas, where he started a haunt in an old ballroom while working as a parking valet for MGM Grand casino. Fright Dome, which opened in the Circus Circus casino in 2003, now packs six haunted houses, four "scare" zones and multiple other attractions and live shows into 250,000 "scare feet." “I feel that ours is successful because there’s so much to do each night, it’s like a full night of terror,” he said. Egan hands out surveys most nights to see what sorts of haunted houses people want to see. That’s led to partnerships with major horror movies like "The Texas Chainsaw Massacre," which has a house at Fright Dome this year for the 40th anniversary of the classic slasher film. 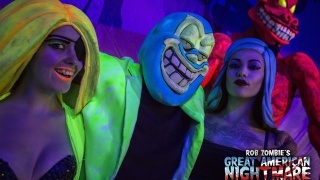 Other features include a "Killer Clown 4-D" haunted house described online as a "twisted play land" and the multisensory "Hyper Charged Zone," which boasts "interactive performers, hatching beats, visual laser displays and special effects that will spark your energy." Egan said his business “keeps growing and growing,” with a Fright Dome location in Hong Kong and another opening in Boston next year. Over at Blackout in New York City, founders Josh Randall and Kristjan Thor are taking on a different approach: they’ve created a house that’s a blank canvas of sorts, one where each visitor’s individual fears are brought to life, not the other way around. A scene from Blackout haunted house in New York City. The pair have used their knowledge of theater to create a minimalist house that takes a psychological toll on visitors. Their latest approach is to cast people inside groups of visitors in a bid to pit those visitors against one another inside the house. That route has allowed visitors to "create something of their own, which is inevitably going to be much worse than anything we could create for them,” Randall said. The two opened a new Blackout location in Los Angeles this year. Kopelman, the veteran haunted house expert, believes houses will become more and more tailored to the fears of individual guests as the years go on. He had patrons wear RFID tags a few years ago so that actors could follow them by name. It didn’t work out so well. “The tech just wasn’t there yet, but I’m still convinced that the more personalized an experience gets, the more scary it will be,” he said. He envisions a future where patrons are immediately singled out and targeted by a haunt’s actors. This means houses must have a heavy online and social media presence and really tap into consumers' personal frights. Like other companies outside of the Halloween industry, haunted house owners will be interested in gathering as much information on patrons as they can: their names, their histories, and of course, their fears. Good actors are what make a haunted house, but investing in technologies and additional entertainment is what keeps customers coming back, he said.